Donna Chancellor, Donna Fujimoto Cole, Josephine Escalante, Bernadette Estoesta Gerhardt, Milagros Garcia Glodava, Angela Im, Eileen Kato, Yvonne Yin-Hung Lee, Sharon Legenza, Kimberly Miyazawa, Connie Rath, Janice Shimokubo, Melinda Yee Franklin) — with Martha Lee. 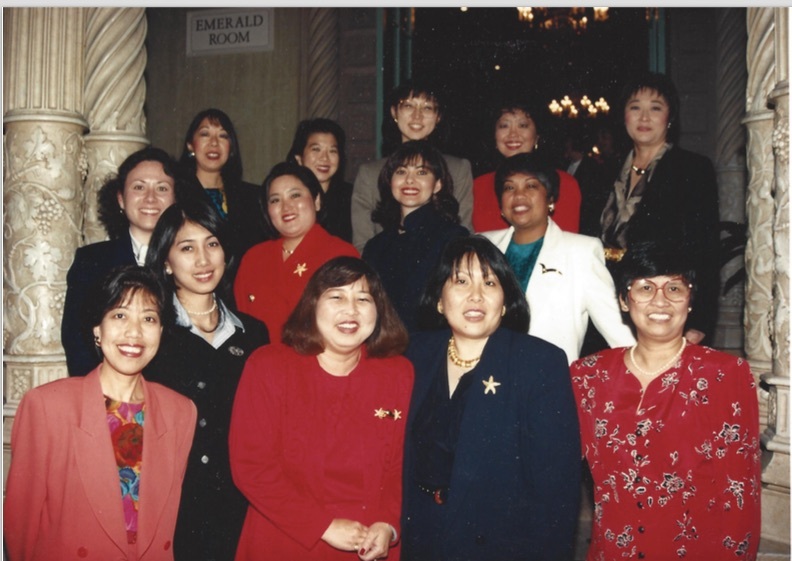 The Center for Asian Pacific American Women's signature leadership program - the Asian Pacific American Women’s Leadership Institute (#APAWLI) - seeks to promote leadership of Asian American and Pacific Islander (AAPI) women in the corporate, nonprofit, and government sectors by fostering the development of AAPI women as whole person leaders. For more than 20 years, and having graduated over 150 women, the APAWLI Program has provided a unique opportunity for AAPI women to gain valuable technical skills to advance in the workplace; develop a clearer understanding of their leadership strengths, assets, and gifts; understand the influence of culture on their leadership and in their relationships; learn and practice balance while traversing the ups and downs of leadership and transitions; and become connected to a growing network of women who are constantly striving to improve the institutions, families, and communities in which they live and work. The Center selects 12-16 AAPI women throughout the country (APAWLI fellows) who have 8+ years of work/community experience and who are already acknowledged within their communities as talented high achievers and role models. This intense learning experience brings together women from diverse ethnicities, cultural backgrounds, geographic areas, ages, careers and interests. Applicants must possess the personal responsibility for their own self-development and the public responsibility for bringing teamwork, diversity, equality, and opportunity to their companies, organizations, communities, and families. APAWLI fellows convene for three sessions over a seven-month period. Each session focuses on specific areas of leadership development. The first session focuses on improving yourself at the personal and individual level, and includes topics related to cultural identity, integration of the physical health and mind, and the qualities and characteristics to lead from within. The second session turns to the interpersonal, focusing on strengths, skills and qualities in order to navigate workplace/community environments, especially during the ups and downs of leading others or facing challenges in your career. The third session moves to the institutional and the power, authority, and influence needed to make change at the societal level. In that third session, participants come full circle in their leadership journey to celebrate where they have been and to identify their next steps as they move beyond the Program. Drawing AAPI women leaders together, while supporting their growth and urging these exceptional women to stride into the world and give back to their communities is only one outcome. During the program, each fellow has the opportunity to impact social change and demonstrate leadership through the identification and guided completion of a learning project that impacts at least 25 people. In addition, fellows receive individual and tailored coaching throughout the seven months to support their personal leadership development journey.